India’s National Telecom Back Bone Bharat Sanchar Nigam Ltd (BSNL) has today comes with another groundbreaking Pan India offer for its Landline subscribers. Now the STD Calls from BSNL Landline to any Landline or Fixed Wireless Phone (any network) across India will cost just 80 paisa per 3 minute !! The new STD tariff is effective from today and applicable to BSNL’s all Landline customers across all the circle as default tariff- without any Add-on pack or cost as earlier we shared on Telecom Talk on November 23rd, 2010. 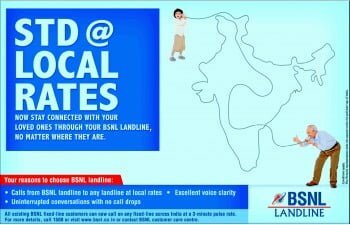 According to BSNL announcement , from today (1 December 2010), All BSNL Landline subscribers (except PCO) can enjoy STD Calls to any Landline or Fixed wireless phone of any network across India just at Local rates, i.e. 80 paisa to Rs. 1.20 (depends on customers Land-line Plan) for 3 minute (180 seconds) as by default tariff. However the STD Calls to Mobile Phone (10 Digit) will be charged as per 1 minute pulse rate. The STD facility (zero Dialing) with dynamic locking system will be provided to all BSNL customers by default with whom 95 facility is available except in those cases where the customer expresses his unwillingness (in writing) to take ‘0’ facility. The existing customers will get this facility without taking any additional security deposit while for new customers, Security Deposit will be Rs.500 for Local plus STD facility . For more details on Landline Tariff Plan call 1500 (toll free from BSNL) or click here. Ladline to landline speaking is the best way of telephonic communication since its clarity is not comparable. Landline connection in home was disconnected because of the noise while making calls, there was frequent cross connections and most of the time it remained dead. All this happen even after repeated complaints. Lodging a complain was painful because nobody lifts the handset at the other end or sometimes they simply keep the handset aside. 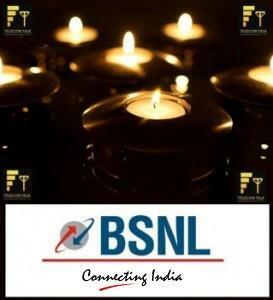 Only bsnl could offer such an attractive one. Ladline to landline speaking is the best way of telephonic communication since its clarity is not comparable. Private operators are not interested in providing landline connections. They want to make more profit from less investment. Consequently, entire private operators in the country hold just 16% of landline market share whereas BSNL and MTNL hold 75% and 9% resply.